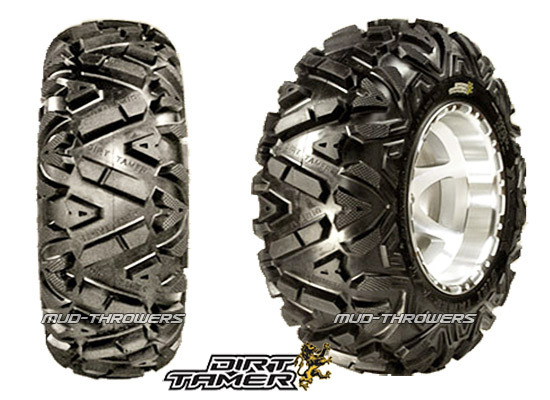 The ever popular GBC Dirt Tamer atv tire is a proven favorite for all utility riders. The bold non-directional tread design has great traction in all types of terrain and conditions. This heavy duty 6-ply rated tire offers serious puncture resistance and its tread lugs run deep into the sidewall for added protection. Love my new GBC Dirt Tamer tires mounted on STI HD3 black wheels. They look great on my Yamaha Rhino. ride smooth and am sure they will perform great. A lot cheaper tire and looks better than the Maxxis Bighorns. Got an excellent deal from Mud Throwers. Quick shipping. Received tire and wheel package two days after I ordered them. Will definitely buy again.